Fresh from Uni I was armed with a music degree and having had plenty of opportunities to perform in a variety of musical contexts on several instruments I certainly thought of myself as a musician at the time. However, I don’t think, looking back, that I was particularly musical. As part of my PGCE we did some improvising and without notation, I froze. I certainly didn’t consider myself to be any kind of composer and singing without the comfort of the formality of a choir with a conductor and the music was my least favourite activity. I shied away from conducting anything and was MD for 4 musicals in my first job from the safety of the piano, despite my having re-arranged all the music for the bands so that everyone who wanted to play could do so, regardless of their ability level. In her blog about this topic Sandie Heckel asks what the definition of a musician actually is and I agree that this is the starting point for this debate. As a trainee music teacher, one project I was asked to teach to year 9 in my 2nd placement school involved the class playing the theme tune from MASH on tuned percussion from notation. Other projects were similar in approach. My mentor fed back to me that my strength in this placement was being able to take a topic and come up with a huge range of musical examples from different genres for students to listen to as part of such projects. What musical understanding, knowledge, skills or musicianship did I need to be able to teach these topics? A basic knowledge of notation would probably have been sufficient and I could have taught myself to read music pretty easily in the same way that when I taught history in my NQT year I learned the content from a textbook. Sadly the MASH project was assessed on how many correct notes and rhythms the students played so it wasn’t really about how it sounded when they all played together. Now that’s where musicianship may have really kicked in, had we worked to play as an ensemble and really refine the performance, but that wasn’t why we were doing it. Later as the idea of ‘starters’ started to become non-negotiable, INSET training provided a wealth of ideas for how to get students focussed. Key Word Hangman, Wordsearches, anagrams on the board, a piece of text or a picture as a stimulus for discussion, all of these started to appear in music lessons (in fact, I still see these regularly on schemes of work and in lessons I watch in various schools). Again, it’s rather too easy to just download these for the interactive white board, you don’t need to be a musician to do this. Then if the core of the lesson involves playing on instruments from a worksheet, couldn’t anyone teach themselves the basics and get on with it? So if that’s the approach we take to music teaching, I’d argue that you don’t need to be a musician to teach it, nor do you need to be musical. Just have a grasp of structuring practical lessons and be willing to teach yourself as you go along! In contrast, I don’t think a non-musican could teach my lessons. For a start, they’re pretty hard to plan for. First you need a musical activity to start with, whether that’s singing, clapping, instrumental or anything else! Then students have a great deal of input into the objectives for the lesson and I can be asked for help with anything from feedback on a musical idea they have composed to how to integrate a vocal line with an accompaniment pattern or how you can add chords to a melody or vice versa. Sometimes I have to stand in the middle of the room and help 30 students to formulate sound into music, or get them all playing something as we devise and refine musical ideas to create a class composition. If they are in groups, I need to help them develop skills on any instrument they may have found in the cupboard or be asked to help them to work out a pattern by ear. From freezing when asked to improvise, I’m making it up on the spot now all the time, modelling how students can experiment with pitch and rhythm until the get to where they want to be and I improvise as a teacher too, having to have a list of musical ‘plan Bs’ up my sleeve in case plan A simply doesn’t work! Now I have trainees of my own, all of whom are perfectly competent and often outstanding musicians. However most struggle with getting to grips with these approaches because they are far from their own musical experiences or are alien in comparison with what they have seen in previous placements. But when they do go with it, seeing someone else embark on that musical journey from musician to musical reminds me of my own journey and reinforces for me that I may finally have got a bit closer to getting it right in my classroom for now. Musical approaches to music teaching require a flexible teacher who is willing to accept they may well have plenty more learning of their own to do before they can really call themselves a “music specialist”. Ooh! For many generalist class primary teachers, music is not a subject in which they have much confidence. I am going to think about this further, having digested Sandy’s blog. Another very interesting debate. Thank you for sharing your thoughts again. It will be interesting to hear views from teachers that ‘do’ music and musicians that ‘do’ teaching. Not very accurate. Music is still a compulsory subject at primary school. The headteacher is responsible for music provision with tin their school. Hubs are charged with supporting local schools. I’m not a “musician”. The word scares me truth be told.Do you mean someone who can play a musical instrument brilliantly? Professionally? Competently? Someone who can make sense of all those squiggles & dots? I love music. I love making music with my classes. I’m willing to put in the ground work, research, learn and prepare so that I can give kids good rich musical experiences they can learn from. I can teach some skills, I can help them with meaningful practise, I can differentiate. I can consolidate I can provide yet more & different opportunities for them to approach concepts differently. I can introduce new genres. I can develop vocal strategies, lead a choir, get kids to mash it up I can teach recorders, I can help kids write songs, make film music & take Peter & Wolf apart. But I am not and never will be a proper “musician”. I’m paddling in the shallows with my grade 1 piano, 3 chords on the uke & singing with community choir. I know that Mrs Gowers isn’t proposing to run me out of town & she raises important questions. Maybe it all depends on how you define musician? I absolutely don’t mean to have an opinion on what others are doing-rather reflect on my own practice and how I feel I have developed as a teacher. Plus I’m not as familiar with primary music as I should be (as Etain will testify to) so have absolutely no right to comment on this! My comments above are about secondary music lessons, but see my previous comment. If we say that yes you have to be a musician/musical to teach music then how does this work in primary where training is often limited and responsibility for music can be in addition to a multitude of other responsibilities. Hats off to you Jackie, You are doing an amazing job and I know this from what you have shared! I am a science teacher and a semi professional trumpet player. I learnt everything I need to know to be a good player from my peripatetic trumpet teacher, who was a world class player. I enjoyed curriculum music lessons and had a fantastic semi professional singer as a music teacher for a time, but she didn’t really teach me anything about being a musician, just more about music. I also had some bloody awful music teachers who weren’t proficient even on their own instruments, and to me that really mattered. So I would consider that a music teacher has to be a musician, yes. Even at primary schools? What about in primary schools where every class teacher teaches their own music lessons. Would you rather they didn’t unless they are a musician? I was so busy thinking about this that I drove the wrong way to school today!! The anecdotes above are all related to secondary lessons and are based on things that I have seen delivered by teachers I am sure consider themselves to be musicians so I’m really sorry Jackie if you have read this as at all critical towards primary music practitioners who I admire immensely for the incredible job that you do, often with very little support or training. Also I don’t think I’ve said you HAVE to be a musician to teach music. However I do think that for a secondary ‘specialist’ to be using non musical content like hangman or word searches is a bit of a cop-out though. In terms of primary pracice, I can’t pass judgement I just haven’t seen enough. However I have two examples which I think make it clear that in whatever sector you work you can see excellent music lessons and those that are less good and the issue this raises for me is that we should be offering far better support and training opportunities for primary and secondary music teachers. This also depends on the value placed on class music by Heads as well, will they release teachers for music training or prioritise other areas especially when money is tight? A few weeks ago I saw part of a lesson where year 6 were learning the cup song. This meant they had to focus on ensemble and timing as well as getting the notes and rhythms right. They worked as a group and in pairs to do this then performed to each other at the end. In contrast my 6th form Music Leaders went to support a year 5 teacher who was leading a ‘pulse activity’ with their class. The teacher got really cross with the class because they just couldn’t get it right and the lesson fell apart. The 6th form had spotted that the reason it went wrong had been because the teacher couldn’t hold the pulse themselves and it was actually them that was out of time not the students! In the same way that some secondary music teachers seem to be quite hard to reach in terms of engaging with discussions like, this I have met primary non specialists on courses, have seen them looking at ideas online, trying them out with classes, teaching themselves to play musical instruments from scratch and as a result teaching really musical lessons, yet not feeling that they themselves are a musician. -There is loads to think about in terms of how we class ourselves as ‘musicicans’ or ‘musical’. Is there still a perception that you can only be musical if you play a musical instrument to a certain standard? If so do our students share this perception? 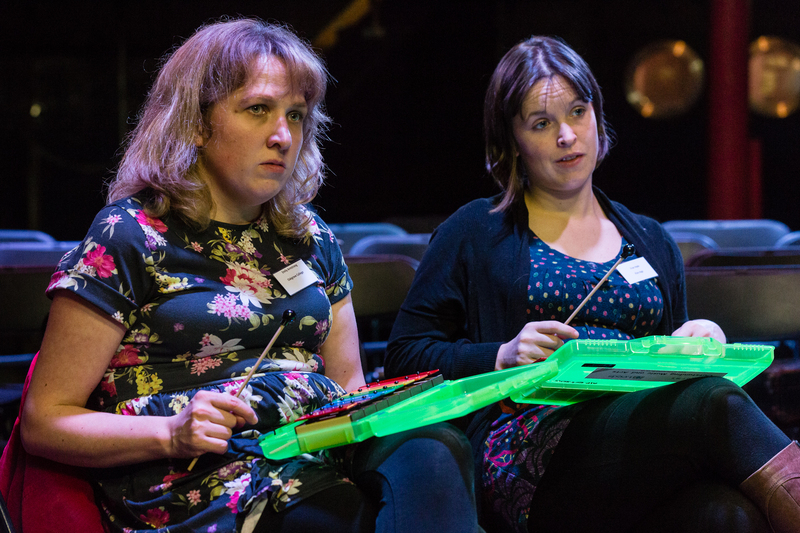 -How can hubs and secondary music departments support primary colleagues looking to do more? -Who makes the judgement in a primary or secondary school as to whether a music lesson is good or not? Do they know what to look for? In my example who could/should have pointed out to the year 5 teacher that perhaps the content of the lesson wasn’t quite right for their particular musical skills? Certainly not my 6th formers! -How could we best share resources for specialists/non specialists to help with confidence amongst those that don’t feel they are musical? Well, the issue of hubs is a thorny one! Clearly, some hubs area better than others. In my area, as far as curriculum music goes, we class teachers who teach primary music need a better dialogue with our hub. Maybe our hub need to to be much more proactive in cultivating us as potential customers of their services? This is really important for schools which need support to provide meaningful musical experiences and opportunities for their pupils. Subject leaders in primary schools have often more than one curriculum area to develop. There is only so much time in the day! Hubs could work with clusters of schools to support their music provision and the teaching and development of music itself. One issue for me over the next year will be to attract live musicians, which is expensive. I understand that hubs have funding, but am not aware that the hub has offered funding to my school, or any others locally for that matter. Do you have to be a musican to teach music? As a parent, paying for music lessons, I would definitely expect the teacher to be a qualified musician. In secondary school, I would expect music teachers to be good musicians as well. Full stop! Primary school music is different. Musicality is an essential ingredient. But, I believe that we all have a basic musicality, which can be released and developed with the right guidance. In our local primary schools, class music is done by a Music Service specialist or more commonly by the class teacher. Music clubs are run by the specialist or teachers who feel confident about music eg leading a choir or teaching recorders. I admire teachers like Jacqui, who, like many others, clearly approaches her music teaching as she does any subject, grappling with objectives, and child-centred learning, planning and assessing etc. Bravo! I also have experience of working with class teachers to use singing with their children. Teachers can be enabled to ‘do’ music with their children. They just need to be shown how to tap into their own musicality and have the tools to move forward, as we did in Herts with the very successful (funded) Singing Strategy in KS1 a few years ago. I have been teaching and leading whole class music from Reception to Year 6 for over 13 years. My background is that I have always been engaged with music both formally through instrumental lessons and O level, and informally through extra curricular activities arranged by the school and my family (Irish tradition…). My musicality was resurrected several years later when my own children began learning instruments. So, when my head teacher asked me if I could teach music, I gulped, agreed, but asked her to purchase a scheme to support me. Move forward to today and I think now I suppose I must be a music specialist. However, I am still only a class teacher who does music. To arrive at this stage, I have had to work hard to grab training and, very importantly, have been prepared to learn with the children. So there have been many ‘wow’ moments for me as I have seen children achieve things, which must have been to do with my teaching! I have long since abandoned the original scheme, preferring now to pick and choose, because I know what I am looking for and what works best. I could not have done this without training, despite a basic high standard of ‘formal’ music learning. As my musicality has developed, I realise that I still have much to learn from musician teachers, who continue to show me the way forward by their good practice. I am always humbled when I go on courses with such teachers. On the other hand, I have met musicians, who are clearly good on their instrument, but have less competence in managing a classroom, are unaware of the importance of engaging children with music-making, involving children in their own learning and the all important issue of ‘pace’, something which head teachers are constantly on the lookout for in observations. I relish each and every opportunity to engage with musicians and musican teachers and teachers who do music. By the way, Musical Futures is one of those organisations which, most recently, has enriched my own thinking and teaching. Others include the Voices Foundation, Trinity Guildhall diploma course and Singup. See below for Patrick’s comment on my reblogging (with his permission). It concerns the singing voice of a year 4 child, for whom English is not his first language, although his spoken language appears ok. He has been in the country for a couple of years, is quiet and his voice is monotone. He engages in music readily but does not volunteer much. Over the last couple of years I have chipped away at him, applying the techniques I know work to find his singing voice. Suddenly yesterday, working with him and his partner, I asked him to sing the Off We Go to begin the song that they were practising. I got the usual low pitched monotone response. Persevering, I suggested his mountaintop voice might work. Lo and behold, out came this pure sound at the pitch we had been working on! He was able to repeat it too! So, while I am not saying that class teachers cannot teach music, I am urging those who do to aspire to arm themselves with as much training and experience of good practice as they can. Because, it can literally change your life and the lives of those you teach!